Posted in: Helpful Hints, Opinion, Photography. When you are working on a new set of images you need to figure out which ones to use and which ones to toss. This is based on a few things of course, and many of the reasons are easily seen by looking at the image by itself, or comparing the image with the FilmStrip above. It’s almost never enough to just look at the File Browser thumbnail array to cull images. If you are like me, you often take a few shots from a single spot of a scene. You vary crop, zoom, and exposure, and maybe other settings or just take a couple because the camera may have moved slightly and blurred the shot. So when you get home and start to process these images there are a few to choose from. At this point, RawTherapee has no easy way to compare images. The current modes are Single Editor and Multiple Editor. Neither of these accomplishes what I need. Notice the two similar images in the Film Strip above. This is the display that I’d like, but with different images in the right and left panel. 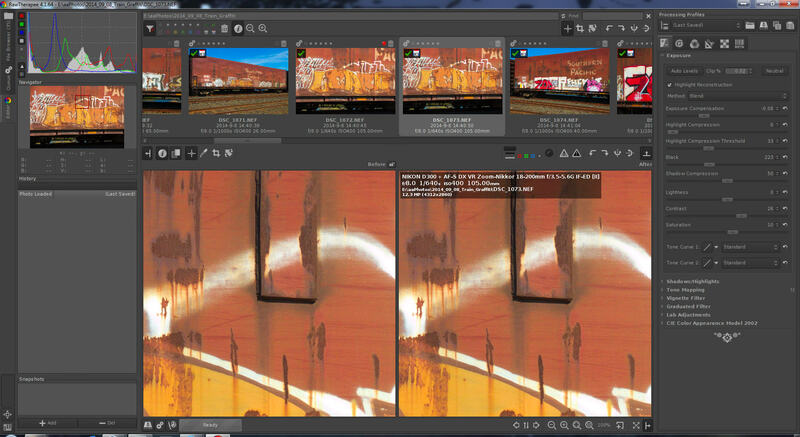 Currently, you can compare only different processing steps of the same image. That’s needed, but doesn’t solve the problem of choosing images to process in the first place. 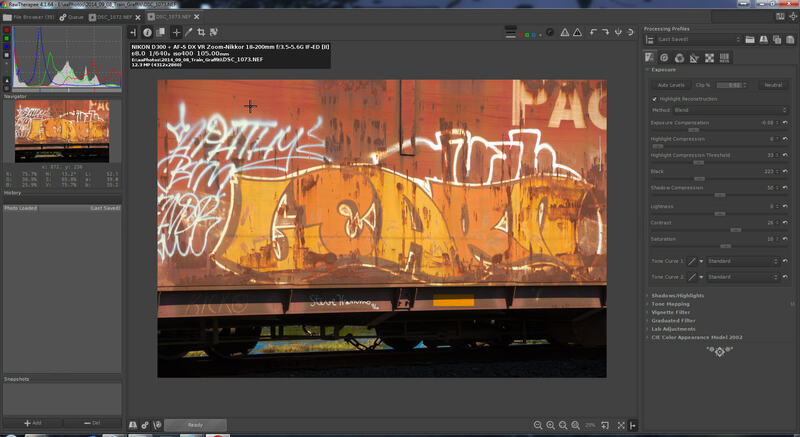 In Multiple Editor Mode, multiple editors are open, each for an image. But only one is displayed at a time. The rest are available at the top of the screen as small tabs, each with the name of the image being edited. This doesn’t help with my need to see more than one image side by side. I’ve made a suggestion in the RawTherapee issues list, and it’s been renamed Light Table Mode, which is fine by me. I suggest an easy way to set this mode in the Editing Display. Enter the Before / After display as you normally would. Allow a second image to be dragged from Filmstrip to either of the images below. The lock will appear locked at this point. The currently edited image can be edited as normal, but the other image will not change. Nor can it be edited unless the Filmstrip is clicked and this causes the normal behavior. The dragged locked image will stay put and the new image will enter the other panel. Zoom / pan is preserved. This allows a detail portion of a series of similar images to be easily compared. The images can be panned / zoomed together as normal. But since the images are now different, registration may not be perfect. So holding CTRL allows either image to be panned separately. When CTRL is lifted, they pan together as before. This allows the two images that were taken of the same scene, but with different azimuth to be aligned for detail comparison. Zoom always locks together for the images as currently. Leaving Before / After mode drops the “other” image and continues to edit the current image. This feature can be used to quickly compare two images as part of a workflow that uses the filmstrip / filters to cull unwanted images before an editing pass that works on setting for the images chosen. It is esp effective for a series of images taken from the same spot of the same scene with slightly differing zoom / crop. The best image[s] can be easily selected for further processing by noting detail / focus and other image properties that are only visible using zoom.